Communicating effectively is important for all kinds of relationships, especially your relationship with yourself. If you tend to experience difficulties with your listening or speaking skills, then the throat chakra bracelet can become an excellent support to catch and express truths in your path. 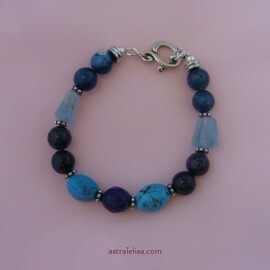 This bracelet combines blue apatite, aquamarine, dumortierite, turquoise and sodalite with silver-plated components; it fits an 8-inch wrist but it can be adjusted to a slightly smaller or larger size.